This is the best steak marinade! 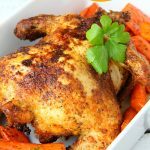 A delicious and easy homemade marinade that’s bursting with flavor! Perfect for any cut of beef, but absolutely divine on Ribeye steaks! The countdown to Memorial Weekend is on and Father’s Day is just around the corner! The grill has been broken in for the season and we’re looking forward to many more afternoons and evenings of preparing our meals out on the deck. We’re big fans of steak in our house, and here in the Midwest, we have some of the best beef around! 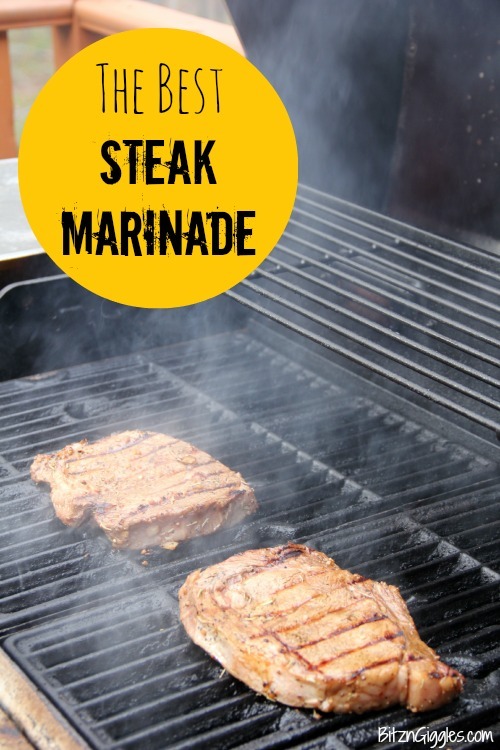 I’ve been preparing this homemade steak marinade for a few years now and have found it to be one of the best recipes I have. It’s so easy to throw together in the morning. During the day you’ll have trouble taking your mind off of the wonderful meal that awaits you! I normally broil or grill the steaks after using this marinade. I start by mixing my concoction of sauces, herbs, garlic and onions in a bowl. 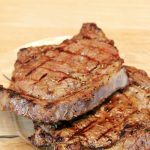 Ribeyes are already one of the most flavorful cuts, and when you pair them with this marinade, it’s heaven. Can you see how I used my fork to poke little holes into the steak? This is to help tenderize the meat and get the marinade right into the center of the meat. It really can’t get much easier than this. After I mix everything, I place the steaks into a Ziploc bag and pour the marinade right in. Now, I like to leave the onions in chunks and the rosemary floating around the liquid. If you’re averse to chunks and roughage, you can always place all of the ingredients into a food processor until well blended and then pour into the bag. 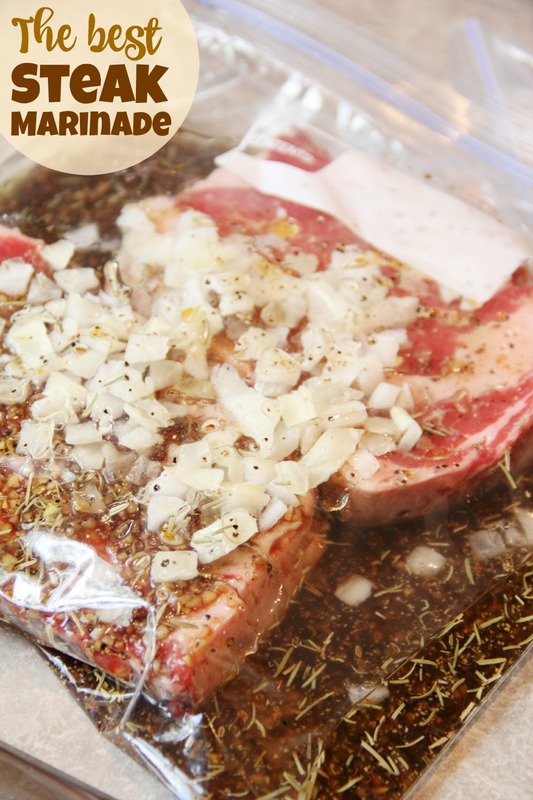 Allow the marinade to infuse the meat for at least four hours. When the meat is ready, it will have soaked up most of the marinade in the bag believe it or not. And, this is when my hubby steps in. He’s the “Grill Master” of the family, or so he likes to be called. I can’t deny he does a killer job. If you think these steaks look good, you should taste the salmon he makes on the grill! We use my famous Brown Sugar Salmon Marinade and the fish just melts in your mouth. I hope you enjoy this marinade recipe as much as we do. Just writing this post is making my mouth water. Thank goodness warm weather is finally here! I have a feeling I’m going to be giving our grill a workout this summer! A delicious marinade, bursting with flavor! 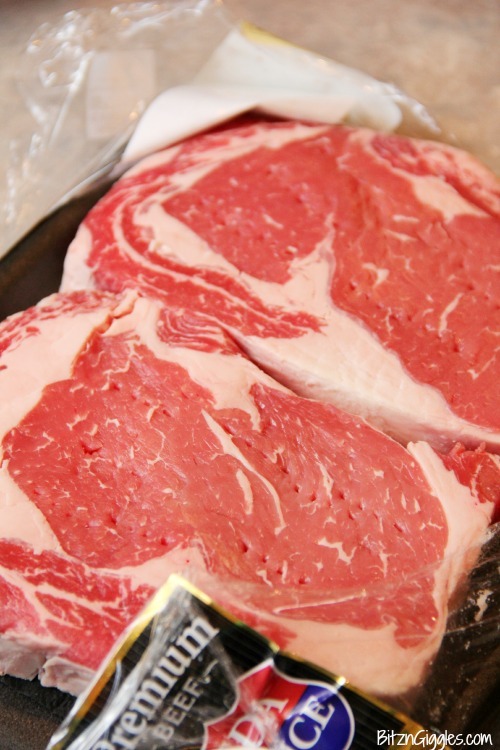 Perfect for any cut of beef, but absolutely divine on Ribeye steaks! Combine all ingredients (except steaks) in a bowl and mix well. Pierce steaks on both sides with a fork, and place into a Ziploc bag. 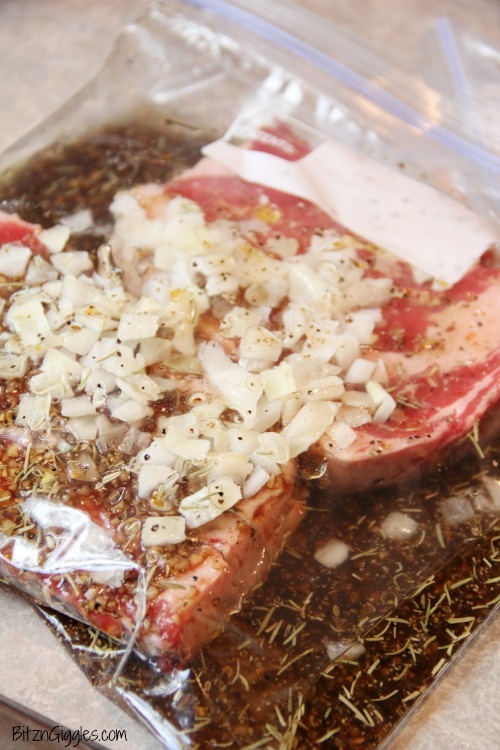 Pour marinade over steaks and refrigerate at least 4 hours, or overnight for the flavors to infuse the meat. When combining all of the ingredients, you could put the mixture into a food processor to get rid of the chunks of onion, etc. – I, however, prefer the larger pieces of garlic and onion on the steaks. It’s all personal preference! The recipe makes enough to marinade 4 – 10 oz. steaks. If your steaks are larger, double the recipe. The meat will soak up all of the goodness! 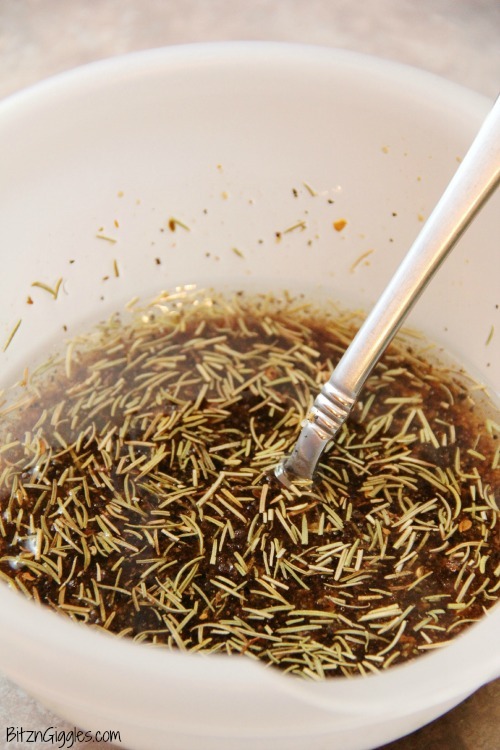 I don’t care for dried rosemary, have you ever tried using fresh sprigs of rosemary? I haven’t, Victoria, but I bet it would work! Sounds delicious! I love that it is grilling season again! Thanks so much for stopping by the Creative Spark Link Party hope you stop by again next Wednesday. Thanks so much for the invite, Marissa! I’ll try to stop by! 1/4 cup of garlic? That seems like a lot? Mixing my ingredients right now. I hope you enjoyed the marinade, Staci! Yes, 1/4 cup minced garlic is absolutely correct. If you aren’t a garlic lover you can probably adjust it a bit. I did about half of the garlic when I made it the first time. Next time I will try the 1/4 cup. 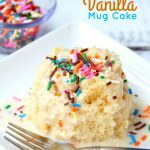 My mother-in-law loved the recipe and I just printed her a copy so she can make it too. Glad you enjoyed the recipe, Staci! I would love to try this marinade. It sounds delicious! Two questions: what is “garlic pepper”, and have you ever tried it in a slow cooker with a tougher piece of beef? Hi Elizabeth! Garlic pepper is a seasoning they sell in the spice aisle at grocery stores. If you can’t find it, you could probably just mix some garlic powder and pepper. I haven’t tried this in the slow cooker. If you do, please let me know how it turns out! Worked awsomly! You made me a masterchef haha. That’s awesome to hear! Glad you enjoyed it! Thanks for the recipe! Making this for my first time now. First time cooking steak ever actually. I am also using half the minced garlic, just to be safe. McCormick is the brand of spices that I trust and they make a garlic pepper grinder which is awesome because you can change the grind size. QUESTION; has this ever been done in the oven, maybe like roasting with potatoes? If possible, what temperature and length of time do you recommend? You don’t want to roast steak with potatoes – it will get way too dry and overdone. You could roast potatoes and then maybe broil your steak? That would be a better option. 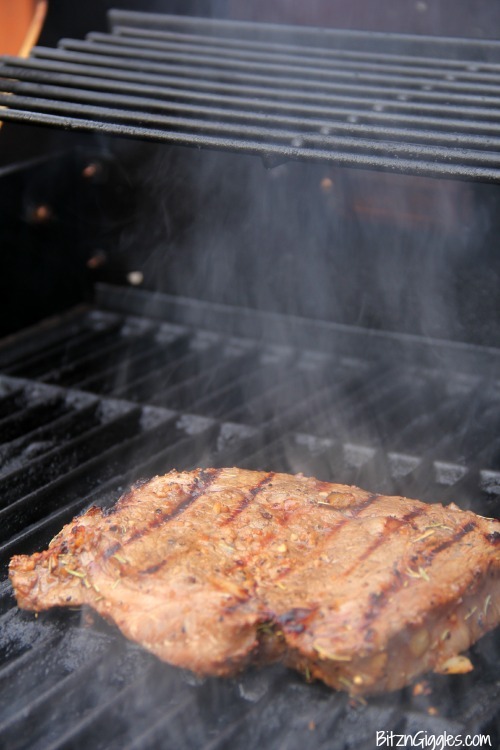 If you like your steak done medium you would be removing the meat from the broiler when it reaches an internal temperature of 155°F. Oh my heavens.. This really is THE BEST marinade!! My whole family devoured our dinner and wanted more. It was absolutely delicious. 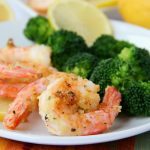 The grilling season just barely began and we have already used this recipe four times! This is my new favorite summer dinner. Thanks so much for sharing!! Oh, Jolene, you just made my day! 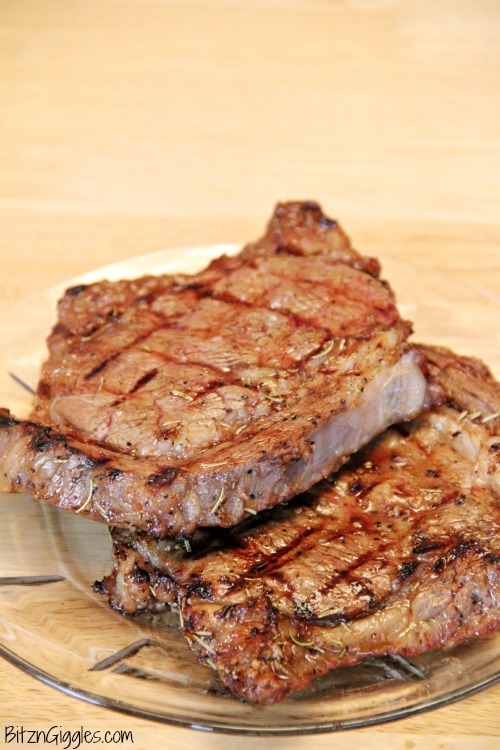 We love this marinade too and I can’t wait to start grilling those steaks! We still have some snow on the ground around here and it’s still really chilly. Send some warmer weather my way if spring has sprung by you, please! The very best marinade!!! Not being a fan of worchestershire sauce or rosemary, I left it out. Used it with sirloin steak that I grilled. Yum! 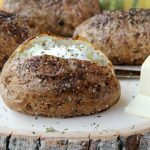 I just made some steaks over the 4th and always use this recipe! So glad you enjoyed it, too, Glenda!